I recently attended an outstanding Arvon Foundation writing course in Shropshire. I will write a blog about that shortly. In researching, I found this piece, commissioned long ago by The Boston Globe but never published, about a writing course on the Greek island of Skyros. It follows the rules on structure set out in my piece The 4 elements of the perfect article: Nut-grafs and Cosmic Kickers. Ten would-be writers sit on a terrace high above the Aegean. We’re lapping up the bright sun, the cool breeze, and advice on how to get our books published. Suddenly we’re interrupted: up the hill, participants in another course are venting their emotions in a cacophony of eerie howling. In response, a donkey brays: a shocking, raucous noise. Everyone laughs. There’s a huge amount of laughter on a Skyros holiday. That’s the idea: by combining holistic holidays, writers’ courses and a Greek island, operator Skyros holds out the promise of both self-improvement and self-discovery in an idyllic setting. But how well do the different elements fit together? The answer is: better than you’d think. 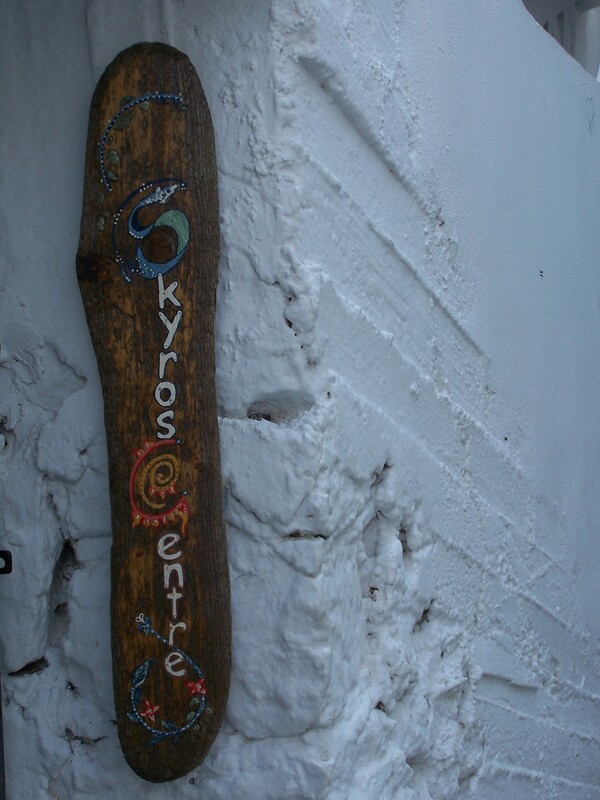 You sense the island of Skyros is something special before the ferry from the Greek mainland even moors. As ship nears shore, music floats across the sea. A cafe on the waterfront is playing “Also Sprach Zarathustra”. It was on Skyros that the sea-nymph Thetis hid her son Achilles, only to have him tricked by Odysseus into sailing to his death at Troy. The island is still a beautiful place to hide out. Bright-blue beehives dot the hillsides. Barren cliffs plunge into Homer’s wine-dark sea. The island capital, Chora, is a tumble of white cubes wrapped around the hillside beneath an ancient monastery. Silver-haired women in black shuffle up stairs and alleyways. Grapes and pomegranates hang everywhere: you can pluck a fig as you walk down to the beach. The air is thick with the scent of jasmine, sage and rosemary. 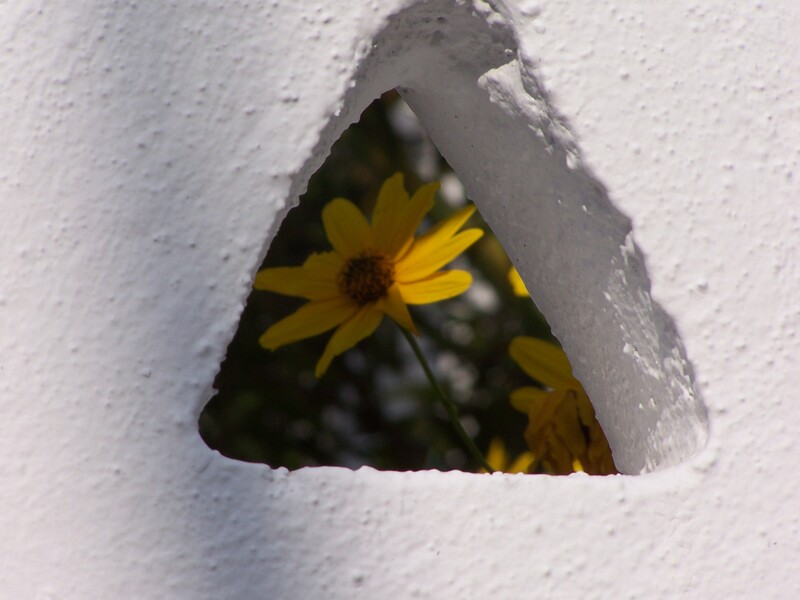 The holistic sessions run by Skyros Holidays have names like “Live Your Dream” or “Seize the Day” (the course doing the howling). The parallel Writers’ Lab courses sound more prosaic: “Fulfil Your Literary Potential” or – the course I’m attending – “How to Get Published”. 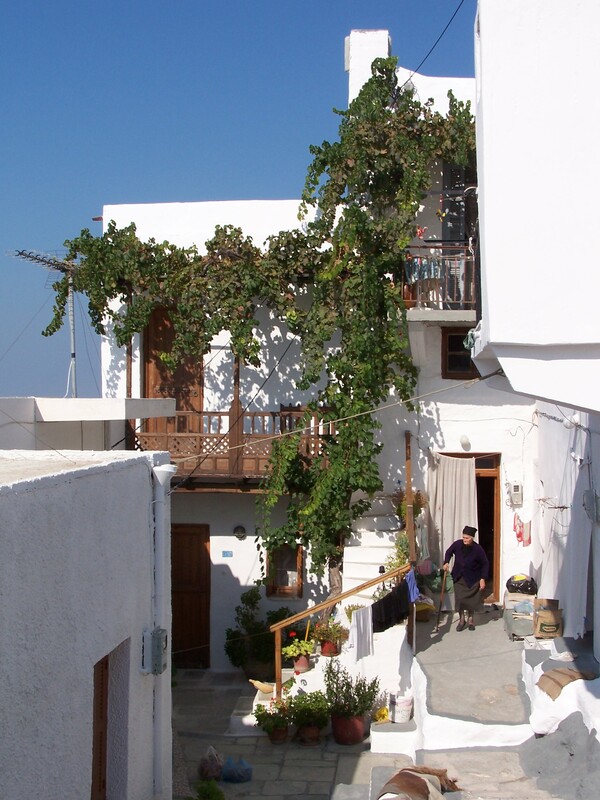 Both are held in the Skyros Centre, a light-filled house and terrace looking through fig trees to the sea. The courses overlap, so you can start your day with a yoga session at 7.15 and continue with breakfast and guided meditation on the terrace before the writing course begins at 10.30. I find the holistic angle intriguing. The “Seize the Day” facilitator, Hazel Carey, leads a session for everyone on the first day in the Apollo Room. Gentle music plays. There’s incense in the air. The aim is to break down barriers: Hazel talks about enabling us “to move to another kind of intimacy”, and “to come home to yourself”. By the end of ninety minutes stretching, massage and movements, I know the names of all the 25 people in the room and feel I’m getting to know who they are. The holistic spirit touches the writing course. One morning we lie on our backs in the sunshine, clearing our minds before Judith reads the start of a story she wants us to complete. Some sessions are practical: we discuss publishing trends and submission letters, and Judith grooms us to deliver punchy presentations on “Why I am a success” to help sell ourselves to agents and publishers. But she also quotes “The Invitation” by Oriah Mountain Dreamer. If there’s no conflict between self-discovery and writing, how about the tension between attending workshop sessions and lying on the beach? I found there weren’t enough hours in the day to do all the things I wanted. But others seemed to cope. In the evenings, the music bars and cafes in the narrow streets of Chora offer opportunities both to chill out and to work up a sweat. As we sit in the Calypso Café on our first night, Sophia Fairchild, an angel therapist from California, rises from her seat and starts swaying to the music. “I promised a friend I’d dance every day for a month for New Orleans,” she says. Actually, the whole week is suffused with a sense of common endeavour. The feeling of mutual support, and the “safe space” provided by the Skyros Centre, help both writers and day-seizers to take steps forward. At the end of the week I leave Skyros impressed both by the writing course and by the impact of a week’s community-building. There’s a strong focus on maintaining connections when the week is over. Many of those attending have been on Skyros courses before. I also like the fact that the place doesn’t take itself too seriously. There’s silence in the Apollo Room. Everywhere, people are stretched out, relaxing, breathing, preparing to meditate. Someone asks Hazel whether it matters what facial expressions we wear. P.S. If you enjoy fresh, original writing, you can friend me on Facebook or sign up for e-mail updates (top right – see the “click here” blue button). Check out the range of writing on this site via the 5 pleasure paths. By Robert Pimm in Writing: about writing on 01/12/2018 .